What is the Best Cutting Board for your Knives? As a home cook, you likely have lots of great kitchen tools and gadgets to make your job in the kitchen easier. You might even have several different types of cutting boards. But do you know which is the best cutting board for your knives? With all this talk about how to keep your knives sharp and in the best condition possible, you don’t want to forget one more important piece of the equation: Which are the best kitchen cutting boards to use. To ensure the longest life possible for your kitchen knives, and to maintain a properly sharpened edge without having to put in a lot of extra maintenance, it’s important to use the right kind of cutting board. Before now, you might have only thought of cutting boards in terms of which was better for sanitation, keeping meats separate from veggies and how easy it was to clean. While those are all very important aspects, there are many other considerations – the top of which should be making sure it’s good for your knives. There are three typical types of cutting boards that are available and regularly used by home cooks: Glass, plastic, bamboo and wood. If you’ve been cooking for a while, or just love kitchen tools, you probably have one of each in your kitchen. Let’s look at each of these types of cutting boards and dissect what is right and wrong about each, with respect to both cleanliness and wear and tear on your knives. In case you’re in a hurry and don’t have time to read our entire guide on finding the right cutting board, we’ve put together a comparison chart with our top cutting boards in each category. You can find more information about each below. The main benefits of a plastic cutting board for me have always been that they are lighter, take up less space and are easy to clean. A plastic cutting board can be a quarter of the thickness of a wooden board. That’s an easy win. You can also put a plastic cutting board into the dishwasher, which can save time and make clean up feel easier. The best plastic cutting boards are made of a high-quality polypropylene (PP) plastic that is BPA free, non-pourous and odor resistent. Even though it’s plastic, it can still be a high-quality cutting board. There are drawbacks of a plastic cutting board that must be considered. The first consideration should always be whether the board is safe to use with your knives. There are differing levels of hardness to a plastic cutting board, so you need to be sure the plastic board you’re using is soft enough to score with the knife. That might freak out some home cooks who see the scoring in the cutting board as a bad thing. If you’re using the knife properly, you shouldn’t have to worry too much about cutting chunks of plastic out of the board. If you ARE cutting chunks out of your plastic cutting board, you should definitely consider changing to a wooden board. Otherwise, the softer plastic cutting surface is very easy on your knives and will keep them quite sharp. That being said, one of the main drawbacks of plastic cutting boards is the inability to properly disinfect a board with deep grooves cut into it. Quoting from a UC Davis study on plastic vs wooden cutting boards, “plastic surfaces that were knife-scarred were impossible to clean and disinfect manually, especially when food residues such as chicken fat were present.” From this we can see that it’s only wise to use a plastic cutting board if you clean it in the dishwasher, rather than by hand. The best type of cutting board overall is a wooden cutting board. 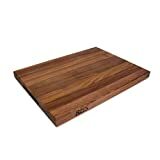 As with all the others, there are specific things to look for to find the best type of wooden cutting board to use. The best type of wood for your knives is a softer wood that is not especially porous. You also want to make sure the wood grain is straight with no criss-cross pattern or integrated nodes or knots in the surface. A straight grain will make for a more consistent track for the blade, so it doesn’t have to compete against hardness. One more thing – never put your wooden cutting board in the dishwasher. There are many different types of wood used to make cutting boards. So how to you know which is the best wood for cutting boards. There’s maple, bamboo, teak, walnut, etc. How do you know which type of wood is best for your knives? Well, the same principle as above still reigns supreme. A softer wood is always better for your knives. The harder the wood is, the harder it will be on your knives. In order to determine just how hard the wood is, you need to look at the Janka hardness scale. On this scale, you’ll find that some common cutting board woods, like teak and walnut fall quite a bit lower on the hardness scale than bamboo and maple. The most common type of wood used for cutting boards in the United States is hard maple. While it’s a slightly harder wood, it is plentifully available and is more affordable than other woods. The surface is strong, durable and resistant to damage. What’s not to like, right? 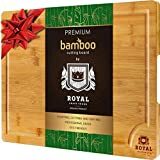 You might actually have a more difficult time finding a maple cutting board these days than a bamboo one, due to bamboo’s popularity. Bamboo also has a similar ranking on the Janka scale. If you want to stick with maple, that’s great, but you’ll probably find that bamboo is easier to find and less expensive. So what about bamboo cutting boards? Bamboo boards have become really popular lately. They can be very nicely made, so they look really good in your kitchen. It’s also become somewhat difficult, and more expensive, to find any other wooden cutting boards than bamboo. They have fancy patterns and nice designs. But are they good for your knives? If you look on the Janka scale, you’ll see that bamboo is fairly hard – even harder than the typical wood used for cutting boards, maple. This makes it especially hard on your knives and can lead to bending of the blade or chips, if you’re not really careful. If you really want to protect the blade of your knives, you probably want to steer clear of using a bamboo cutting board for large amounts of cutting and chopping. If you like the look of it, you could use a bamboo board for minor cutting, like at the your home bar, or just use it to form your mise en place, as you cut on another board. 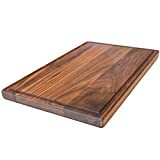 A good alternative wooden cutting board to the typical maple and bamboo is walnut. Walnut is less hard than the other two types of wood and thus easier on your knives. They look nice and have a darker finish so stains and knife cuts won’t show as easily. Wood surfaces are also known to be better at protecting against bacteria than plastic boards because the wood provides a natural barrier that plastic can’t. You do need to be careful to wash it properly after each use since it can’t be put in the dishwasher for a thorough disinfecting. If it comes right down to it, I would recommend a walnut cutting board over any of the other options available. It’s the easiest on your knifes and won’t cause the damage that some cutting boards cause. It’s nice to have an easily cleanable glass cutting board on your countertop where you can set food that you’re preparing for a meal, but the glass cutting board’s purpose should end there. It’s incredibly easy to clean off a glass board when you’re finished with it. I can appreciate that. But the glass itself is very damaging to a blade due to the hardness factor of the glass. Unless you’re using super strong knives made of steel or ceramic (and really not even then) you should not be using glass or marble (or any other type of stone) as a cutting board. If your knife can’t score the board you’re using, then the board isn’t soft enough and can cause chips and bending of the knife blade. There are many factors involved in choosing the best cutting board for your knives. So there might not be one easy answer as to which you should choose. As long as you avoid hard surface, such as glass and marble, and make sure you’re applying the proper knife techniques, you shouldn’t have to constantly be sharpening your knives. Like this post? You can save it to your Pinterest board for later. Sharpening a Ceramic Knife: Can it be done? What Types of Kitchen Knives Do You Need? Thanks. Wooden cutting boards are fantastic for meal prep. What about disinfecting wood and/or bamboo boards–there have been many reports about bacteria in wood boards and I’ve seen mold in wood cutting boards that I had to tell people to toss out or risk their health. That’s a good question, Bill. You do have to maintain your boards to keep them bacteria free. I use pure white vinegar to rub down the board every week or so. If it develops off smells, I’ll rub it down with lemon too. Never run a wooden board through the dishwasher or soak it in the sink. It needs to dry out completely between uses. OntheSharpSide.com is a participant in the Amazon Services LLC Associates Program. For more information see our Disclaimer page. On the Sharp Side Copyright © 2019.